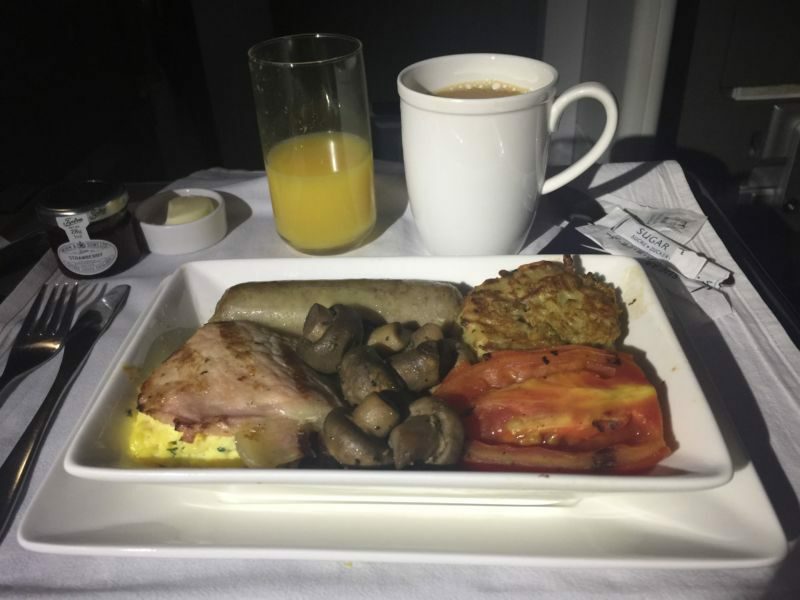 Napa Food and Vine’s tour of Great Britain and Europe started with California Girl and me flying on a Sunday night from San Francisco to London Heathrow. 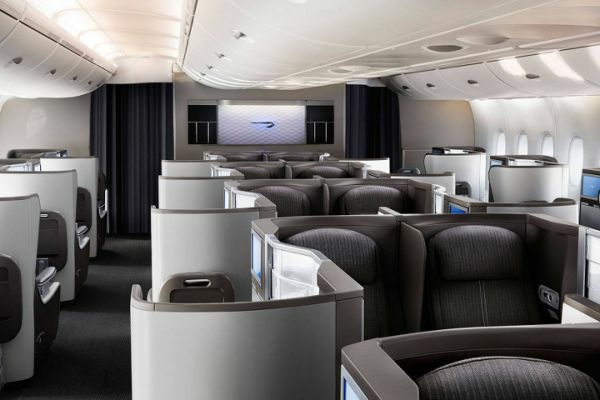 We flew British Airways business class, or to use their official branding: Club World. 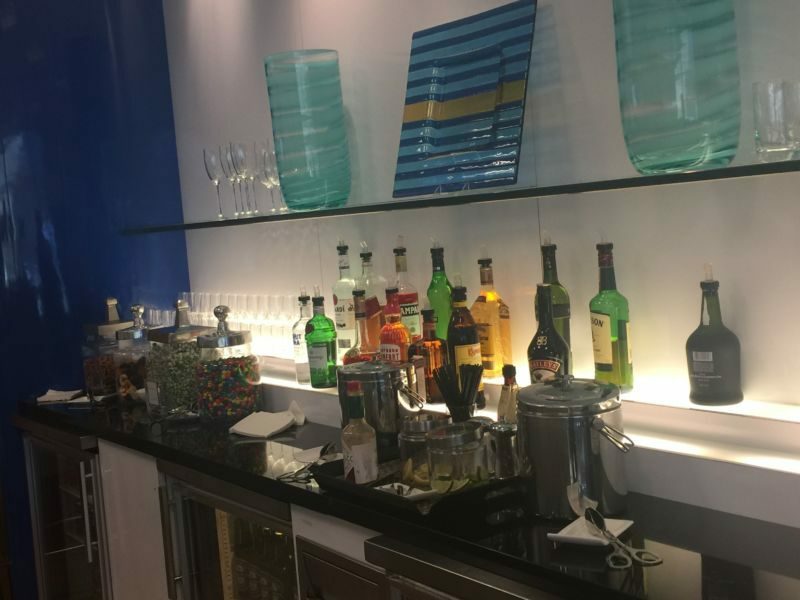 California Girl comments: We started our journey in the very nice British Airways lounge at SFO. They had a fantastic selection of wines, spirits, and nibbles. 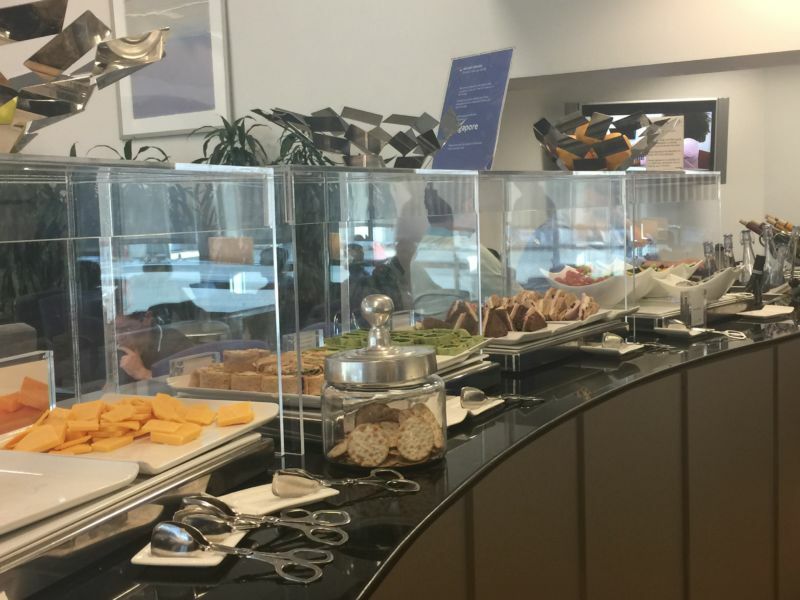 I was particularly impressed with the serve yourself sandwiches which managed to be both English in style and stuffed for the American appetite. I was less impressed however with the boarding process at our gate. It was crazy! Now, everyone knows how the Brits just love to queue, but this was the most disorganized nightmare. Passengers were in a free for all to board the plane. There weren’t rows called, priority given to First or Business Class, nada. It was a mad dash pushing through the crowds until it was split off into cabins. Several of the other passengers commented to us about how poor the setup was. To add insult to injury British Airways makes Business Class check in 24 hours in advance to get your seat. There is no choosing your seat before this time. We had a hard time getting seats so that we were able to sit together. 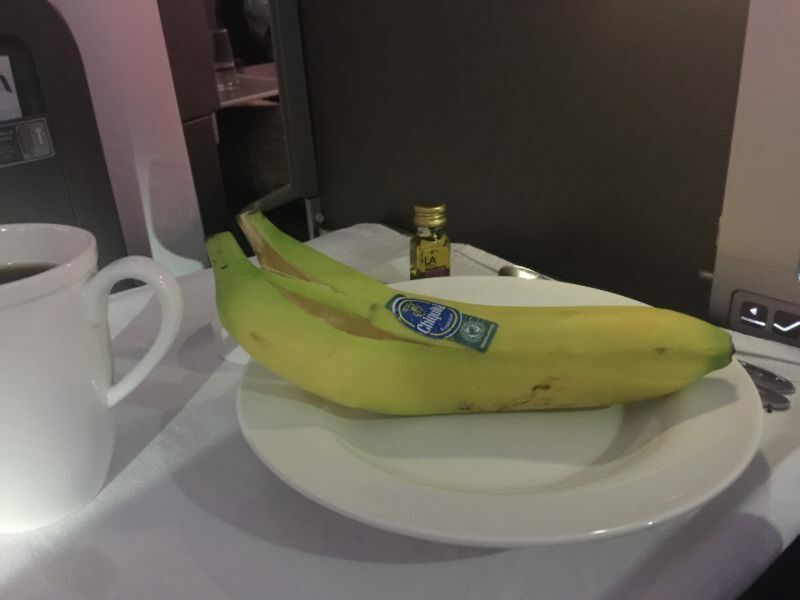 It isn’t what I expect paying the extra premium. I would hope that I will at least be able to have the same basics as economy. 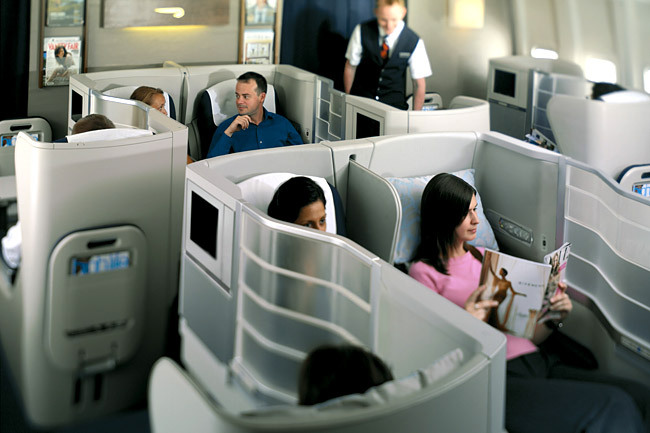 The plane was an Airbus 380, one of the relatively new double-decker planes, which seats 469 passengers. We were on the lower deck and sat together in two backward facing middle seats. The seats are in pods that partially shield them from the aisle seats and those in the next row. There is a screen that can be raised to complete that separation, but nothing other than armrests between these two seats. The seats go completely flat to make it a little less difficult to sleep during the flight, but when flat these middle seats are completely cut-off from the aisle by the outside seats. Once everyone was horizontal, it was not possible to get out to the bathrooms. California Girl comments: You might notice the lack of decent photographs in this post. That was because I was unable to access my camera, or my laptop during the flight as we were stuck. That meant that I also wasn’t able to work on board the aircraft. Not much good for BUSINESS CLASS right? Whilst the plane boarded, we were offered sparkling wine. This was disappointing, as the wine was dry and sparkling, but that was all it was; it lacked the flavour of the Prosecco that California Girl had drunk in the airport lounge. 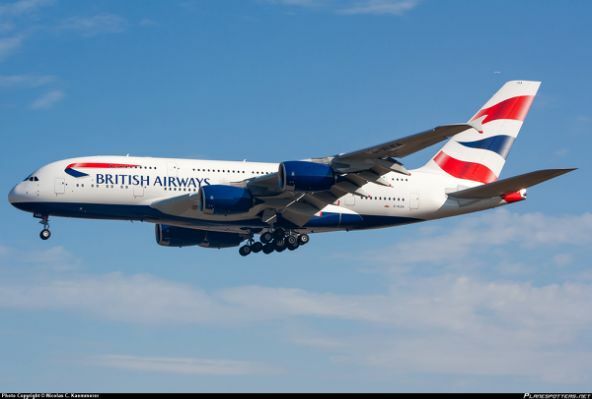 California Girl comments: What The Brit was politely trying to say is that the sparkling wine on the plane was not good. I don’t think they could have procured anything worse. It had the flavor of a used sweat sock. You all know for me not to drink sparkling wine it has to be bad. Mine was basically untouched. 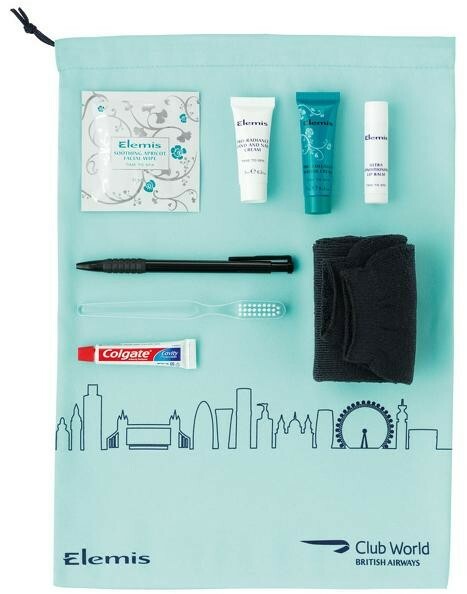 We were then given our “Complimentary” wash kits. Wow, things have changed. There was a pair of socks, earplugs, an eye mask, a toothbrush & paste, a lip balm, and some lotion. That was the contents of our bags. There was no comb, nor was there any shaving things for guys. Back in the old days both of those things were included with little things like dental floss, a bottle of water, mints, refresh wipes, and deodorant. Once airborne we were asked if we would like a glass of wine. California Girl asked what red wine options they had. The stewardess replied that they had a Californian and an Italian; an answer that whilst accurate was not entirely useful. California Girl was being served from the right-hand aisle, whilst my steward was in the left-hand aisle. I asked the same question and got a slightly more informative response; they had a Hahn and a Valpolicella. Being good bloggers, we ordered different wines. The Hahn was their GSM, of which we have a bottle or two at home. California Girl comments: A red wine list isn’t that hard to remember if you are only serving two choices. The menu mentioned that there were several sparkling wines and champagne offered but our stewardess seemed a bit puzzled with that. The GSM was perfectly good and I enjoyed my glass. The Valpolicella was somewhat lifeless; it offered a nose of damp wood. Tasting it there was a distinct acidity, moderate acidity, and a very subtle hint of blackberry. The wine was drinkable, but was a poor reflection of wines from the region. Whenever a steward came to ask us a question, bring us something, or take away empties they had to lean across the person in the aisle seat and push the button on the seat that lowered the screen and then do so again to raise it. Placing these buttons on the outside of the chair would reduce the amount of personal space invasion needed during the flight. California Girl comments: It was so annoying to have this screen being pressed up and down over and over. I felt so sorry for the guy that was on the other side of me. It felt so rude to me. The stewardess was reaching right across him. A HUGE thumbs down with that. The other thing that I found quite funny is the menu stating that British Airlines provides “Height Cuisine”. We didn’t find cuisine at all, but meh food that wasn’t much better than what was served in Economy. We both ordered the smoked-salmon to start. I choose a Chardonnay to accompany it. The Chardonnay was heavy on the oak, with butter as the secondary characteristic; the fruit came a distant third. I do not as a rule like this style of wine, but with an unusually strong smoke on the salmon it worked well. 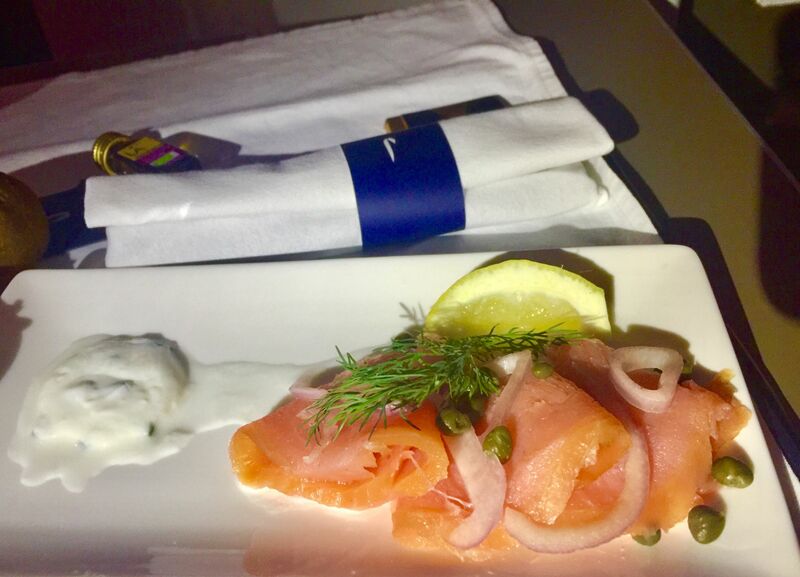 I was really impressed with the salmon; all too often smoked salmon in the US has but a hint of smoke; here it was rich and complex. Strangely, a dark chocolate square came with the starter; this would have seemed to be a better accompaniment for the coffee that followed dessert. Not that this odd timing stopped the chocolate being eaten once we were done with the salmon. California Girl comments: Another crazy serving faux pas was the service of the dinner rolls. Aside from reaching over my fellow passenger with all of my food, I was presented with a basket of rolls in which to choose one to eat with my meal. That would have been fine aside from the fact there were no tongs and I was expected to grab one with my fingers. How gross is that? Do I know that all of the other people before me had clean hands? I didn’t eat my roll. 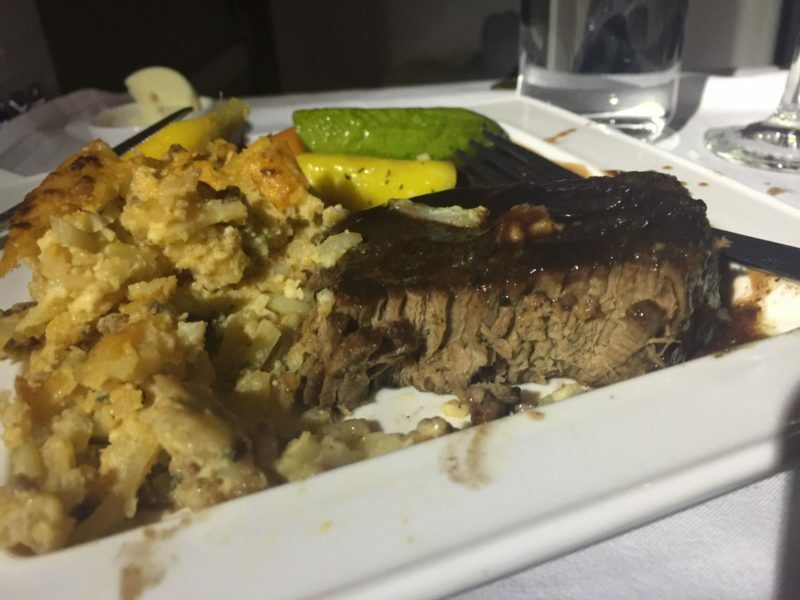 The main course was a piece of steak, with an odd potato cake, and lightly cooked vegetables. This latter component was the best part of the entrée; the carrots were crunchy and flavourful. My meat was cooked slightly pink and was adequate; California Girl was less lucky. California Girl comments: The meal was inedible. The meat was overcooked to the point of gross. The potato cake was so bizarre I couldn’t even figure out what they were going for with it. It wasn’t a typical rosti, or even a potato au gratin stack, but something in between. Its texture and flavor were both odd. 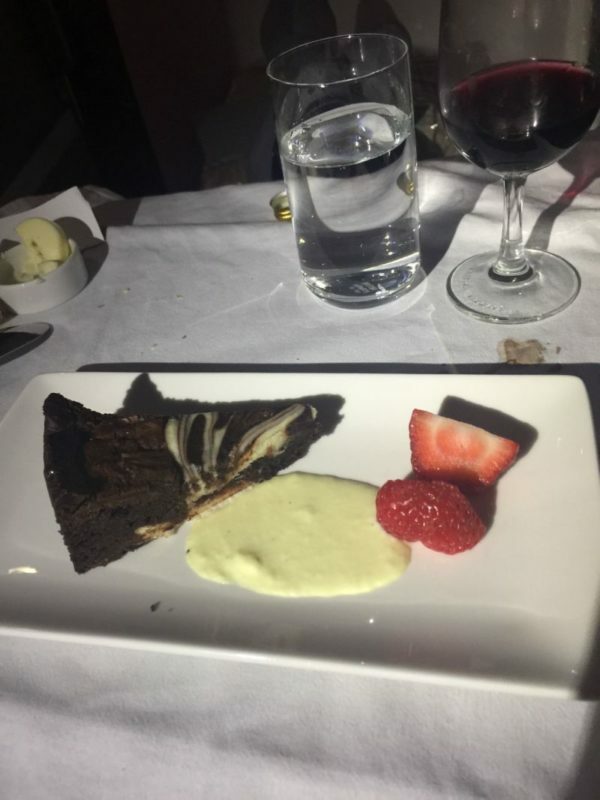 Since we had ordered the same starter and identical main courses, I took one for the team and picked a different dessert from California Girl. I asked for fruit, expecting a plate with assorted items; I was offered a bowl with whole fruits. I took the banana, which whilst tasty, clearly lacked the photogenic advantages of California Girl’s chocolate cake. California Girl comments: The chocolate cake was by far the star of the meal, and basically I had that for my dinner. It was moist and had good flavor with a cheesecake swirl in it and a vanilla sauce. Each course was brought on china plates; we were provided with linen napkins, metal cutlery, and actual glassware. There was a large video screen that folded out from the pod walls and provided a wide range of films to watch. However, once dinner was complete it was about 10:30pm California time and we both tired. We opted to attempt to sleep rather than watch. I managed a couple of hours of sleep, so apologies that we cannot comment on the viewing experience nor the quality of the provided headphones. California Girl comments: The plane was over hot and there were no controls for cooling or any kind of fan. Even economy class has those. On top of being stuck in my seat, with no water or bathroom, I was uncomfortable and didn’t get one wink of sleep. 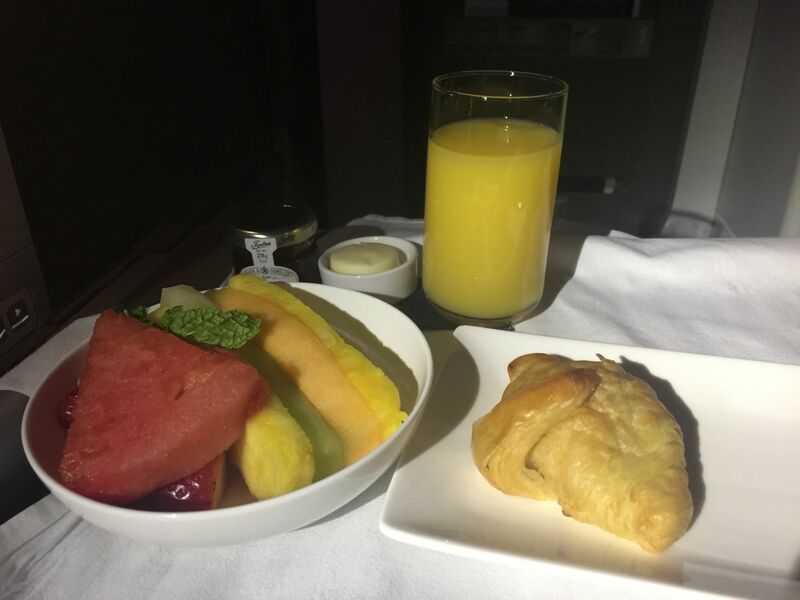 Breakfast was served around noon UK time, an hour and a half before we landed. We started with fruit, which this time was the plate of different types that I had expected for dinner. It was excellent with juicy, sweet strawberries, despite it being the wrong season in both UK and US. The pineapple and melon were also very tasty. The croissant was soft and flaky; too much so for the butter that was extremely hard. We both opted for the cooked English breakfast. California Girl was disappointed by the absence of baked beans. I, likewise, wished for the inclusion of black-pudding. The bacon and especially the sausage were tasty. The potato cake, different from that which had accompanied dinner, was once again odd, but not inedible. California Girl comments: As I didn’t really have any dinner, I was looking forward to breakfast. Again the bread was served with no tongs. I was hungry enough this time to take one. My food was so unappealing I didn’t bother to eat it. I guess the bacon was OK, but the eggs looked and tasted like faux eggs and the sausage and potato just weren’t good. Now I was both tired and hungry. Overall, the experience was adequate. The food was OK. The wine was drinkable, although the sparkling wine did not meet that bar. California Girl will be returning from her tour on United Airlines, so it will be interesting to see how their Business Class experience compares. California Girl comments: I disagree with The Brit. I think that it was appalling service and trip. Every single reason one would give for flying Business Class was taken away. I was uncomfortable, hungry, thirsty and tired. That is not what I was expecting at all. It has never been this way in the past. I wouldn’t ever choose to fly this airline again. 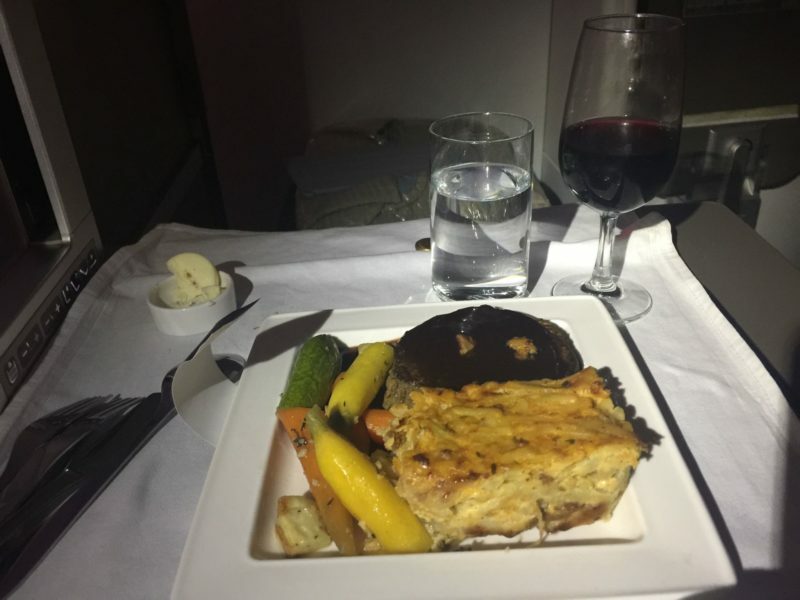 As we were writing this post, we were speaking to a friend who travels frequently for work on British Airways Business Class. She agreed with absolutely every single one of our comments and added that she no longer flies them and flies Emirates instead. I don’t blame her in the least. And the winner of Patricia V. Davis’s book: Cooking for Ghosts is….